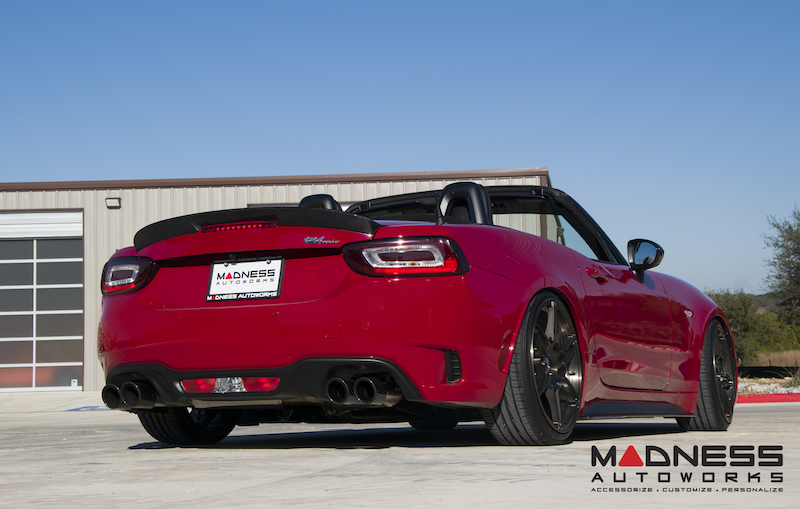 If you're looking to extract more power and performance out of your Fiat 124 Spider Abarth, you're options are relatively limited, however Madness Autoworks of Signal Hill, California will soon have owners of the all-new convertible Abarth covered with their tuning program for the car. 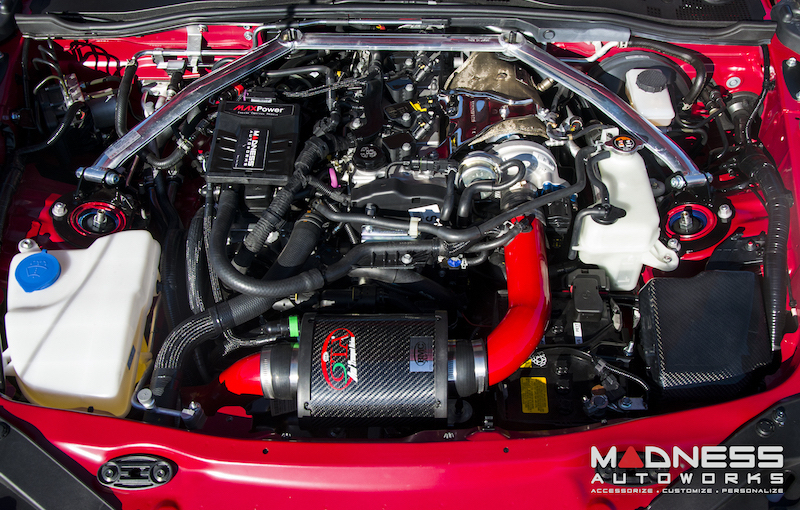 Madness' demo car for the tuning program, picture here, is fitted with a new fully sealed intake, a custom quad-tip exhaust with carbon fiber tips and an engine tune, bringing output from160 horsepower to around 200 horsepower. Torque numbers for the performance package weren't provided, but we're assuming it's up from the stock car's 184 lb-ft. The power upgrades are undergoing certification for CARB approval and Madness expects them to be road legal in all 50 states by the spring. Madness also has you covered in the looks department. Their demo car is fitted with 18-inch forged wheels designed specifically for the car by Fittipaldi Wheels, which appears to have some relation to Formula 1 world champion and two-time Indianapolis 500 winner Emerson Fittipaldi. Other upgrades include a Madness carbon fiber lip spoiler, carbon fiber side skirts and carbon fiber Abarth badges. The interior has been mildly upgraded with a custom Italian-made carbon fiber shift knob and leather shift boot and handbrake boot. The TMC Motorsport unit, on which it appears to be based, claims 151 kW and 290 Nm. Have they posted any dynos? Not that I'm aware of, but the claim is made on their website. They offer a 30 day money back guarantee on their product, which I feel puts weight behind their claims. @MotoPete do you know of any good performance tunes available for our cars?